New Fambit mobile application is here! It has already over a thousand downloads on Android Market and Apple App Store. Www.Fambit.com is a network and mobile service for families to share memories and photos and to manage schedules within the family circle. The web service is available in five language versions and has gathered 6000 registered users. The new Fambit mobile application keeps you on track with the family events. As soon as something changes in your Fambit Calendar, a notifier is shown on your phone, even if the application is not running. Using the notifier it is easy to navigate to the application and see details about the changes in the calendar. You no longer need to open the application just to check if there’s something new. If you so wish, you can add your family events from Fambit to your phone’s own calendar application as well. Fambit Photoframe is the newest innovation in our mobile application. 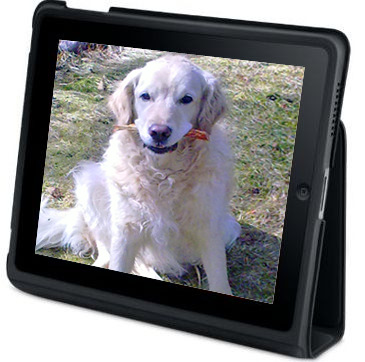 With one click, you can turn an iPad or an Android tablet into a photo frame, where you can see all the latest photos added to your family. Everybody in the Fambit family can add photos either using the mobile application or the web service. The new photo will soon be visible to all family members: on the iPad at the living room table, on the tablet that was given to Granny last Christmas and on the screen of Dad’s iPhone while he is traveling. The photoframe experience is a unique innovation of Fambit. The current one-purpose photoframes lack an easy mechanism to update photos. On the other hand, the popular photo-sharing services like Flickr, Picasa and Photobucket tend to be complicated – especially when sharing photos within a group of people. Find the Fambit application under the name “Fambit” at Android Market and Apple App Store. This entry was posted on October 19, 2011 at 1:39 pm and is filed under Uncategorized. You can follow any responses to this entry through the RSS 2.0 feed. You can leave a response, or trackback from your own site.